Your plug-in can use decorators to annotate the images for resources and other objects that appear in the workbench views. Decorators are useful when your plug-in adds functionality for existing resource types. Many of the standard workbench views participate in showing decorations. For example, PDE contributes decorators that allow you to distinguish between binary and source projects. 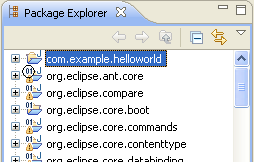 The com.example.helloworld project is the only source project shown in the package explorer. Note how all of the other binary projects show the binary decorator at the top left of the Java project icon. This decorator is contributed by PDE using the org.eclipse.ui.decorators extension point. There are several different ways to supply a decorator implementation. This markup uses the simplest way, known as a declarative lightweight decorator. When a declarative lightweight decorator is defined, the markup contains a complete description of the decorator's icon, placement, and enabling conditions. Declarative decorators are useful when only an icon is used to decorate the label. The plug-in need only specify the quadrant where the decorator should be overlayed on the regular icon and the icon for the overlay. As shown in the picture, the PDE binary icon is overlayed in the top left quadrant of the package icon. Decorators are ultimately controlled by the user via the workbench Label Decorations preferences page. Individual decorators can be turned on and off. Even so, it is a good idea to design your decorators so that they do not overlap or conflict with existing platform SDK decorators. If multiple plug-ins contribute lightweight decorators to the same quadrant, the conflicts are resolved non-deterministically. Your plug-in may also do all of the image and label management itself. In this case, the lightweight attribute should be set to false and the class attribute should name a class that implements ILabelDecorator. This class allows you to decorate the original label's image and text with your own annotations. It gives you increased flexibility since you aren't limited to prefixes, suffixes, and simple quadrant overlays. Other attributes of a decorator are independent of the particular implementation style. 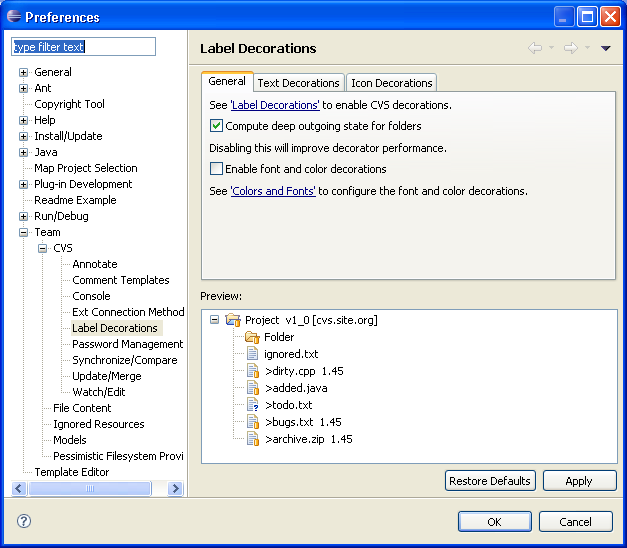 The label and description attributes designate the text that is used to name and describe the decorator in the preferences dialog. The objectClass names the class of objects to which the decorator should be applied. The enablement attribute allows you to describe the conditions under which the object should be decorated. The adaptable flag indicates whether objects that adapt to IResource should also be decorated. The state flag controls whether the decorator is visible by default. If your decorators include information that is expensive to compute or potentially distracting, you may want to contribute your own preferences that allow the user to further fine-tune the decorator once it is on. This technique is used by the CVS client. Decoration is initiated by refreshing label providers that use the DecoratorManager to provide decoration. As decoration processing is done in the background there will be a period between when the label is requested and the labelProviderChanged event is fired that will be taken up by decoration calculation. During this time decoration on an Object will only be calculated once for effeciency reasons. If the decorator changes during this time it is possible that a stale result will be broadcast as the second and subsequent calls to decorate an element will be ignored. Decorator contributors should avoid changing thier decorators while decoration is occuring. If this is not possible a second call to decorate an element after the labelProviderChanged in processed will be required.